In 2017 Jim and I drove thousands of miles in a number of different trips. When you’re in the car together that much, literally a few inches apart, it helps to have entertainment. Fortunately, we like to talk with one another, so the types of things one might muse about silently instead become topics for conversation. For example, after noticing a stop sign and considering how it looks like a snowball block, I asked, “If you start with a square and want to make a regular octagon from it, how do you calculate the length so each of the 8 sides is the same?” Huh? Okay, look at the two illustrations below. The one on the left is a stop sign. It’s a regular octagon, meaning that all of the angles are equal and all of the lengths are equal. The diagonal segments of the octagon are the same lengths as the horizontal and vertical segments. I noted the dimensions as a for the vertical and horizontal segments, and c for the diagonal segments. As you can see, a = c. (Click the image to open the gallery and see larger.) The segment lengths are all the same. The dotted segment noted as b is not part of the octagon. If you extend the vertical and horizontal lines to create a square, b is the extension. On the right is an illustration of a square, red & white snowball block. (This specific snowball block is designed to pair with something like a 9-patch block.) For the octagon (white, 8-sided shape,) the angles are all the same. However, the lengths of the octagon line segments are not the same. The diagonal segments of the octagon c are longer than the horizontal and vertical segments a. Why? For this particular block, each side of the square is cut in thirds; a = b. Going down the left side of the square, the top red segment b is equal in length to the center white segment a, which is equal to the lower red segment. The equal lengths make it easy to pair this block with a 9-patch. But the equal lengths of a and b mean the diagonals c are longer by a factor of 1.414. The general idea is the same for all snowball blocks, with the length of c the diagonal dependent on the length of the two triangle legs. See the primer on the Pythagorean theorem at the bottom of the post if you want to know more. Why does it matter? At the time it was just curiosity, but I quickly found a project to apply it. In spring of 2018 I took a workshop with Toby Lischko on making New York Beauty blocks. She taught a simple way to use curved rulers and paper piecing to create these lovely, complex blocks. This was mine. 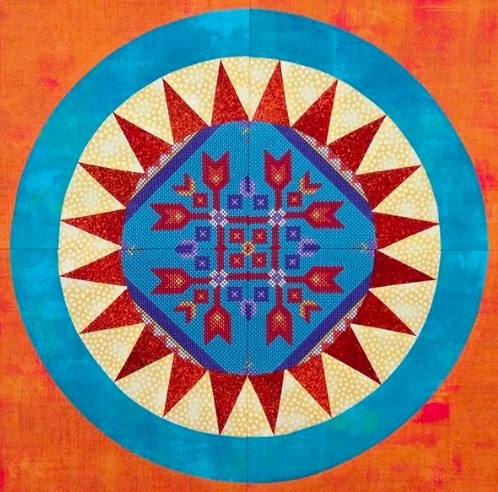 After I made it, I thought about how to use it to center a quilt. My design idea would work best if the center was a regular octagon. With Jim’s formula in hand, knowing the size of the square, I solved for a and b, which let me know how big to cut the stitch-and-flip squares to make the corners. a = 7.04, or just barely over 7″. Since the finished side of the square is 17″ and a (the center segment) is 7″, the other two segments b are 5″ each. I cut my stitch and flip corners 5.5″ each. This is the result. The finished length of the diagonals (along the purple/orange seam) is the same as the finished length of the orange segment along the horizontal and vertical sides of the square. For a right triangle, the square of the length of the diagonal (hypotenuse) is equal to the sum of the squares of the other two sides. We often see this expressed as a² + b² = c². To find c, take the square root of c². 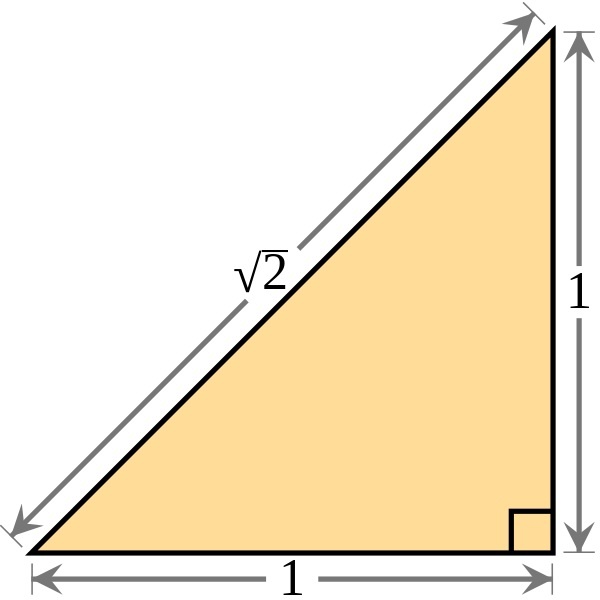 In the case to the left, a = 1; a² = 1; b = 1; b² = 1; a² + b² = c² = 2; c is the square root of 2, or 1.414.
length x 1.414 = diagonal. 6″/1.414 = 4.243″, or very close to 4 1/4″. This is also useful in the next step of the Wind River Beauty. Agreed, you gotta be something of a math nerd to work through all this. I’m glad all my quilts don’t require this process, but it’s a wonderful tool to use for a few. 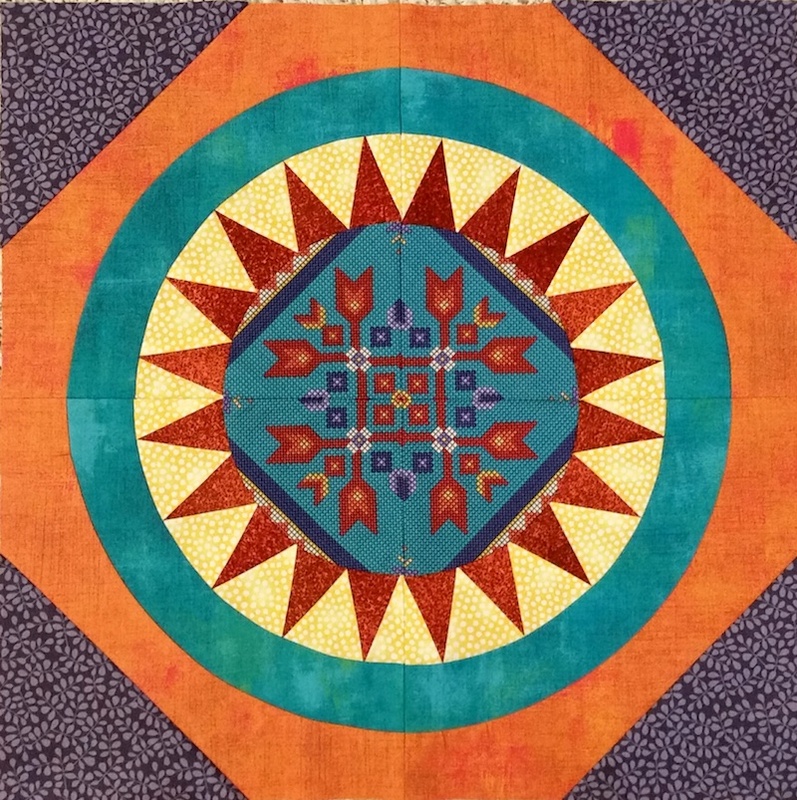 This entry was posted in Medallion Quilts, Quilting and tagged Center block, Medallion center block, Original design, Process, Pythagorean theorem, Quilt math, Snowball blocks, Solving problems, Toby Lischko, Tutorial on January 27, 2019 by Melanie McNeil.